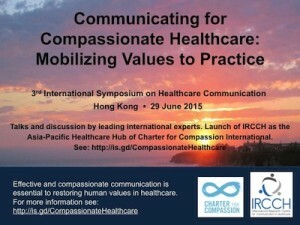 Human values are fundamental to the practice of compassionate, ethical, and safe healthcare. the foundation of all healthcare? The International Charter for Human Values in Healthcare is an interprofessional collaborative effort involving people, organizations and institutions around the world working together to restore core human values to healthcare. These human values include Compassion, Respect for Persons, Commitment to Integrity and Ethical Practice, Commitment to Excellence, and Justice in Healthcare. Placing emphasis on our core values will help to solve many problems in healthcare -- ranging from excessive cost and profit to inadequate care for the less fortunate and underserved. The Charter is meant to inspire a movement to improve care by restoring the primacy of human values, to place them at the center, and to make them the goal of every effort in healthcare. Participate to heal our world. The Charter was initiated in early 2011 by a dedicated group of internationally recognized healthcare clinicians, educators, leaders and scholars. Many additional individuals, patients and caregivers from around the world have contributed to the Charter.